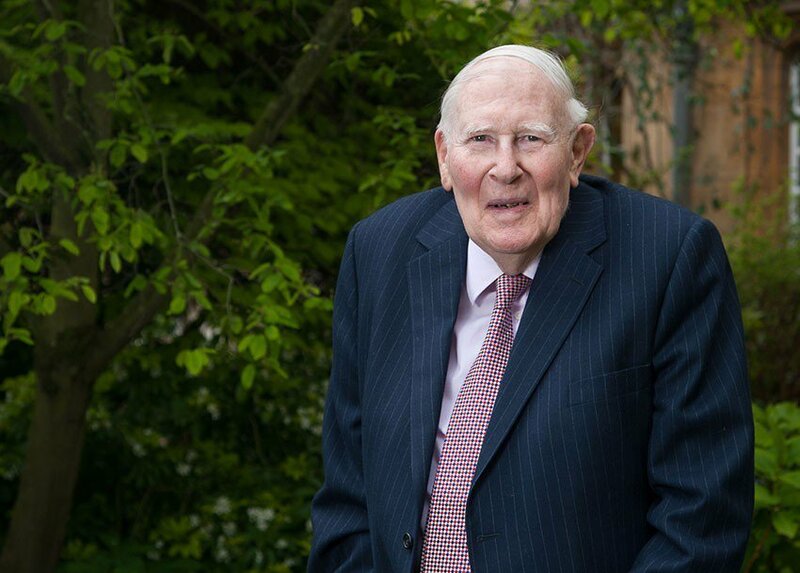 A celebration of the life of Exeter College alumnus and honorary fellow Sir Roger Bannister CH CBE (1946, Physiological Sciences) took place last month at the Sheldonian Theatre. The event, which was filmed and is available to watch above, was jointly hosted by the University (especially Exeter, Harris Manchester, Merton and Pembroke Colleges) and the City of Oxford. For example, Exeter choristers helped lead the singing, and Exeter student volunteers were among the marshals. The service, on 14 November, brought together people from many spheres whose lives Sir Roger had touched, including academics, medics, sportspeople, politicians, as well as family and friends. The Rector of Exeter College, Professor Sir Rick Trainor, spoke about Sir Roger’s early years and time as an undergraduate student at Exeter College. Those four years, he suggested, accelerated Sir Roger’s personal, academic and athletic development. Sir Roger, he pointed out, “thrived in the raucous egalitarian atmosphere in which young men and returning war veterans mixed in Exeter’s Junior Common Room”, of which he was elected President. Olympic medallist Steve Cram, a middle-distance runner who, like Sir Roger, has run a mile in under four minutes, then spoke about Sir Roger’s celebrated athletics career and how it inspired him and others like him. He said: “It is rare to make such an impact in four minutes and rarer still for one act to have such a resonance. It went viral, to use a modern parlance, and still resonates today, 64 years later. “There have been other stand-out achievements in sport but I don’t think any have resonated as much with the general public – not only here in Oxford but around the world. Professor Dafydd Thomas, Professor Emeritus of Clinical Neuroscience at Imperial College, London, spoke about Sir Roger’s exceptional medical career, of which Sir Roger was prouder than the athletics achievements for which he was best known. Next Dame Lynne Brindley, Master of Pembroke College, spoke about Sir Roger’s time as head of that college from 1985 to 1993, before Tim Stevenson, HM Lord-Lieutenant of Oxfordshire, discussed Sir Roger’s considerable contribution to Oxfordshire. Last to speak was Lady Moyra Bannister, Sir Roger’s wife of 62 years and a distinguished artist, who received a standing ovation after her moving remarks. She spoke of her husband’s courage, adding that he could be fearless “almost to the point of recklessness” as he threw himself into outdoor pursuits. She continued: “Even when he was at his most exasperating, you could not help but love him. He approached every facet of life with gusto and he imparted his love of life and the values he held to his family. His ethos was to find out what you are good at and give it your all, this is the course he took. Speaking after the service, Sir Roger’s daughter, Rev Charlotte Bannister-Parker, said the family had been overwhelmed with the huge outpouring of support shown after the death of Sir Roger in March, aged 88. She said: “We are so grateful that he has been remembered for all aspects of his life. This service recognised not just what he achieved in running but for his medical endeavours and his deep love of this city. “His time as a student, at Iffley Road, as a master of a college and in his retirement – it all meant so much to him and he always made it his mission to continue to support Oxford. The event in the Sheldonian was followed by a tea party in the Town Hall, which featured speeches by the Lord Mayor and by Thurstan Bannister (1979, PPE). The celebration is available to watch in full at the top of this page. To read more about Sir Roger and his time at Exeter College click here.